The University of Washington is looking at building an innovative office tower over the new station, where others had hoped for a public plaza for farmers markets and more. 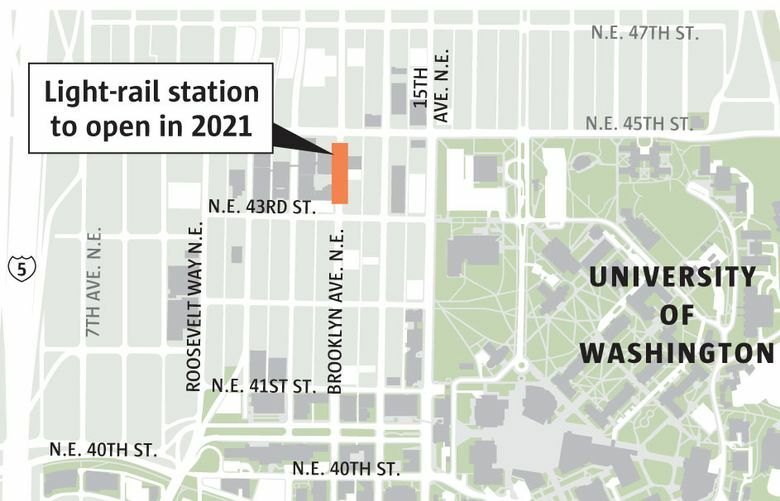 The University of Washington is taking steps toward building an innovative office tower over the new U District light-rail station, a site where some had hoped to develop a public plaza for farmers markets, street fairs and outdoor cafes. The UW doesn’t yet have firm plans for the site, according to a spokesman. But signs point toward an office tower up to 240 feet tall, if the city allows such height, following recommendations to the university from a panel of development experts. “High-density office development above the transit station provides an opportunity to create a ‘front door’ to the University of Washington and brand the area as an innovation district,” according to recommendations from the local chapter of the Urban Land Institute (ULI). The terms “important gateway,” “powerful catalyst” and “branding mechanism” are used in the ULI report, which suggests relocating the University Book Store to the first floor of a tower, where “an updated version of a hip bookstore” would be a key attraction. The UW acquired the development rights above the station from Sound Transit in 2013. Sound Transit board members next month will consider amending that deal, said an agency spokesman, to get more money from the UW to pay for fortifying the site to support a larger building. “We’re going to spell out what it’s going to cost to accommodate that,” Sound Transit’s Bruce Gray said. That discussion likely will occur at a Sept. 10 meeting of Sound Transit’s capital committee, Gray said. Sound Transit already had agreed to provide a platform to support an 85-foot-tall building. But a potential upzone of the neighborhood by the city has prompted the UW to consider going higher. A new tower could reshape the heart of the U District, spur other office development and intensify a hunt for open space in the district. The U District Station site is south of the Neptune Theatre on Brooklyn Avenue Northeast, between Northeast 43rd and 45th streets. The station block is now zoned for 65-foot-tall buildings. But the City Council is expected to allow considerably taller towers when it rezones the neighborhood next year. Light-rail service from Husky Stadium to Northgate is expected to start in 2021. A public plaza above the station was advocated for years by retired UW architecture professor Phil Thiel, who died in May 2014. But the fate of a plaza was a foregone conclusion once the UW and Sound Transit struck a deal transferring development rights above the station to the university, said former City Councilmember Peter Steinbrueck, who supported Thiel’s proposal. “It’s been a frustrating and difficult result,” Steinbrueck said. A residential building would be better than an office tower, given housing needs, he said, and open space would be even better, considering the area’s density is expected to increase. A committee that advises the UW and city officials on planning reaffirmed its support, in a vote last week, for the plaza idea, said Matt Fox, co-chair of the City/University Community Advisory Committee (CUCAC). Fox said he had not seen the ULI report. But residential and open space were not the best options for the station site, said UW spokesman Victor Balta, for reasons largely spelled out in the March 2015 ULI report. The report hasn’t been shared with community groups such as CUCAC, Balta said, because the university doesn’t yet have plans or designs to share. Rents from student housing would not provide enough cash flow to support the cost of a high-rise building, the ULI said. Faculty and staff would not want to live that close to the student population, the panel said. To help brand the area as the UW’s front door, the panel called for moving the University Book Store into the tower’s first and second floors. 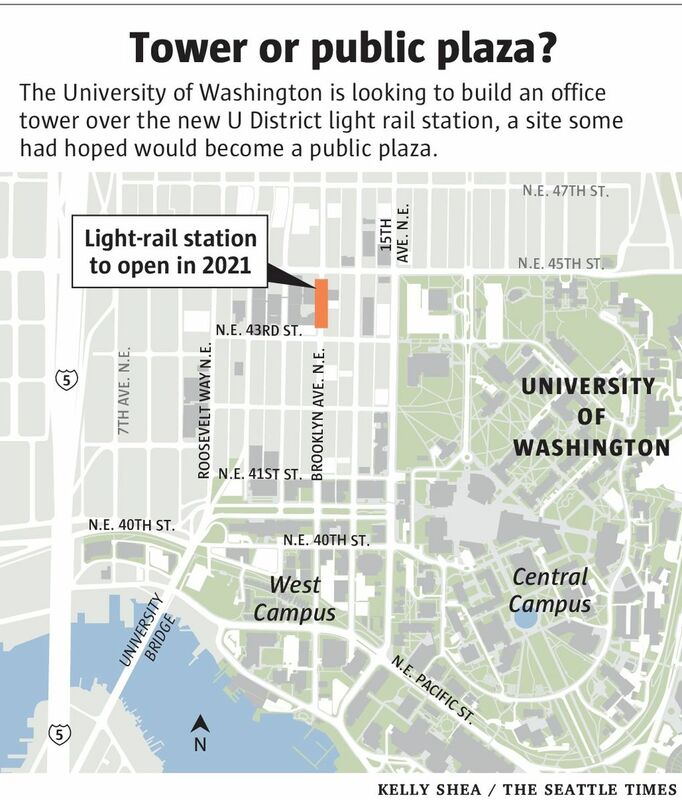 “Many departments within UW that strategically complement the innovation concept, such as business, computer science and engineering could relocate certain functions to the new tower,” the ULI said. A tower up to 240 feet would be in scale with the neighborhood and wouldn’t trigger added costs associated with building taller, according to the panel. The problem, though, that Steinbrueck sees is the U District’s lack of a “town square.” As the area grows, open space “becomes more of an imperative,” he said. City officials working with neighborhood leaders on a parks plan for the U District released an update report earlier this month. There is already funding for new parks adjacent to the University Heights Center and the Portage Bay waterfront. But no Parks money is now available for the neighborhood’s top priority — a central plaza near the light-rail station, said Dave LaClergue, a manager with the Department of Planning and Development. So officials are considering what zoning and other incentives the city might use to entice property owners, developers and possibly the university to help achieve that goal, LaClergue said. Officials plan to make Brooklyn Avenue in front of the station a carless “festival street”to accommodate farmers-market stalls, he said. Some neighbors are very bullish on a large plaza, while others are more concerned about whether the city would be able to keep it safe, he said. The ULI panel was chaired by Al Levine, former deputy executive director of the Seattle Housing Authority. It also included six development executives, an architect, a lawyer for developers and two retail consultants. As the ULI noted, one building doesn’t make an innovation district like those at Stanford and the University of Pennsylvania to attract corporate partners, students and faculty. The UW needs to explore using other properties and assembling land, the panel said.